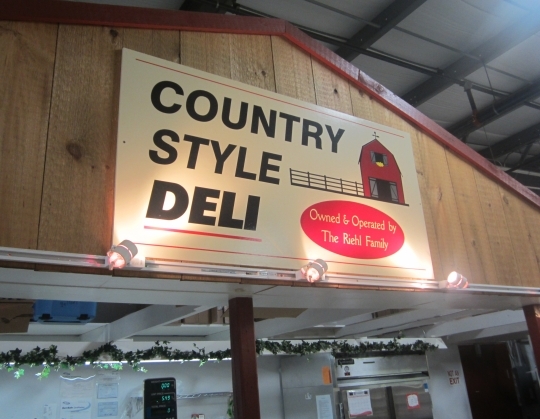 How about a few photos today from Country Style Deli at the Markets at Shrewsbury (York County, PA). This deli is run by the Riehl family, friends of mine from Lancaster County. 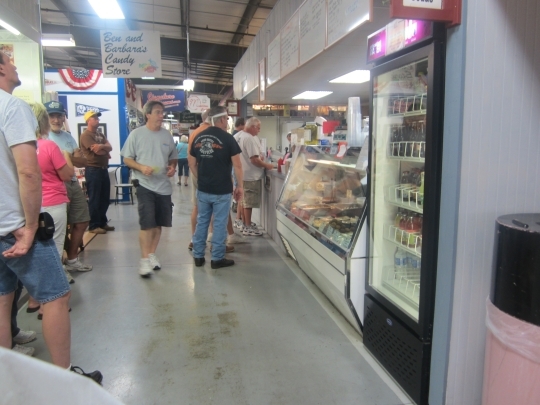 Amish markets are typically open for business 3 days per week (Thurs-Sat), though some stand owners may come on Wednesday to do prep work, particularly if you have a food stand which requires a lot of “pre-game prep”. This is what the Riehls do. To get to Shrewsbury they make the one-and-a-half-hour trek with a van driver, typically setting off in the wee hours and sometimes returning after dark as well. If you like sub sandwiches, I’m not sure where you’ll get a tastier one–or a better value. Country Style’s subs are thick and customizable. The Riehl McCoy, with a variety of lunch meats plus crunchy bacon strips, is my favorite. I should have gotten a photo of the last one I ate, but it disappeared too quickly to be captured on camera. The Riehls also carries a wide selection of cheeses and meats including some delicious smoked salami and beef jerky as well as tasty cheese spreads which you can sample. Get your subs (and seafood) here. Wash it all down with some of this. 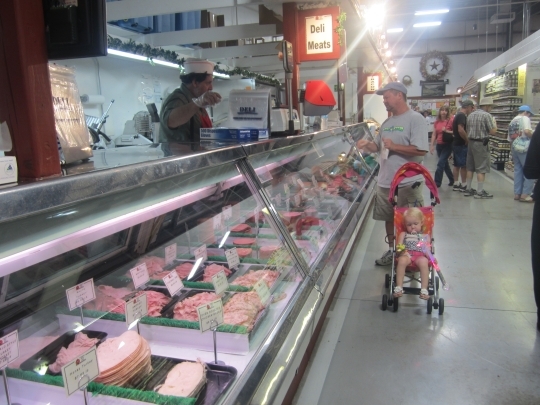 When you visit a Pennsylvania Dutch Market it’s a fun ecosystem to be in. It’s a slice of “Amish Country” contained in a fully-wired building often far from the farms and fields we associate with the Amish. There is a family atmosphere with mom and dad often both involved and kids milling about and helping as well. The people that run market stands are usually not the silent, stoic types and don’t mind having a chat with customers if they’re not too busy. Here’s a corner of the vast Penn Dutch furniture market, occupying by far the largest floor space at Shrewsbury. 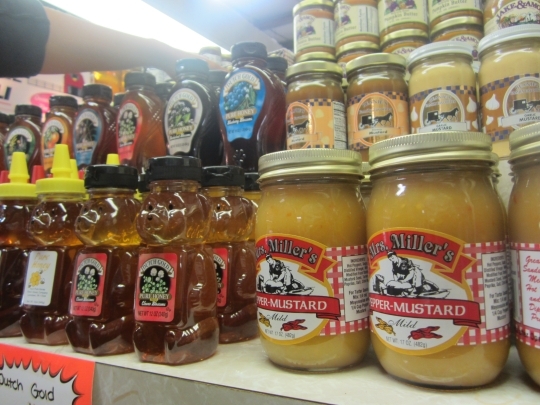 The spreads and jams shop (right across from Country Style). And here’s the website for Shrewsbury, and the cruise night photos if you missed them. Thanks, Erik, I will put these on the list for the trip to Pa next June. Love the pun, Riehl McCoy! In return, do you know Farmerstown Furniture in Farmerstown, Ohio? Amazing furniture and some lovely tricks to catch out the customers! If you haven’t been, you’ll have to go, to find out what I mean. The owner has a wonderful sense of humour – another far-cry from the stern and solemn stereotypical Amishman! Thanks for the tip Fran–I’ve never been in to FF but now you’ve got me curious. The market doesn’t “look” Amish. 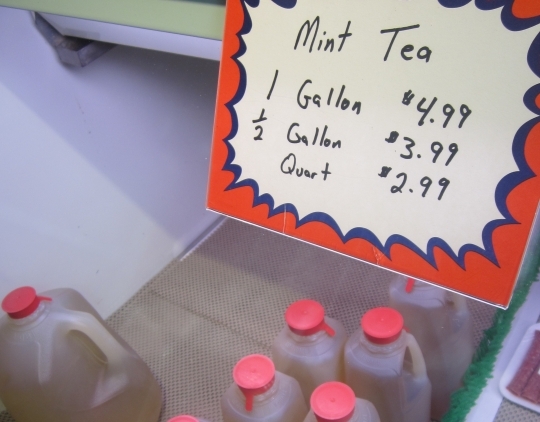 I wish we had similar markets up this way (not just the one I’ve heard about in Chicago), selling Amish food and wares. 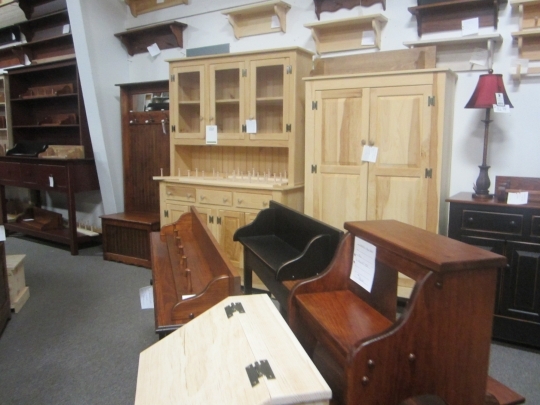 The furniture really caught my eye…yes, we have Amish furniture shops around here, but I’d love to rub elbows with actual craftsmen! Alice Mary, I wish I had that kind of metabolism! Running around helps. Speaking of hummingbirds, the ones I’ve been seeing in NC are looking pretty plumped up…apparently to make it across the Gulf of Mexico in one go. I had breakfast less than an hour ago and now I am hungry again! That sandwich sounds yummy – could you please email me one? Erik, thanks for getting a photo of the furniture shop. I love the woodwork stuff the best of anything. Erik have you tried a stuffed pretzel sandwich yet, a specialty in this area. Nice post Erik and my mouth is watering thinking about those sandwiches, and to be honest I have never been to this market or even knew it existed. I have been to the Harley Davidson plant In York county for a few factory tours (they are free) and in fact I am shooting to go down that way again this weekend so I will try and make a pit stop at this market. Erik is it me or is almost every sandwich in the Lancaster area be of the stuffed pretzel variety, it seems to be a specialty and I have to say that I “love them”. I think this area is pretty much the pretzel capital of America anyway, and folks if you have not had a steak and cheese stuffed pretzel your really missing out on something. The best one that I have tried has been from an Amish food stand at the Green Dragon Market, sadly this market is only open on Fridays (seems crazy). And these folks also make the best cinnamon bread that I’ve ever tasted, and when you pick it up to buy it you will notice that its pretty warm and smells great! Yes I have Richard–two thumbs up. Can’t remember what was in it, but was mucho tasty. Hi Erik, you were in my neck of the woods – I’m less than an hour from there. Richard, just take 83 down to Shrewsbury and it’s right around the (country) corner. Haven’t been there for a while, but your post makes me think I’ll have to get over there soon again. Thanks for the pics! Thanks Rita I was just at the markets web site, some pretty interesting shops but its always those food stands that get my attention! And this one looks nice and clean as well. I love delis at farmer’s markets. I also like the sound of butcher’s at work regardless of the store setting. The sound of the screaming saw cutting something into pieces of meaty goodness. Maybe that’s what I should look into doing for a career.